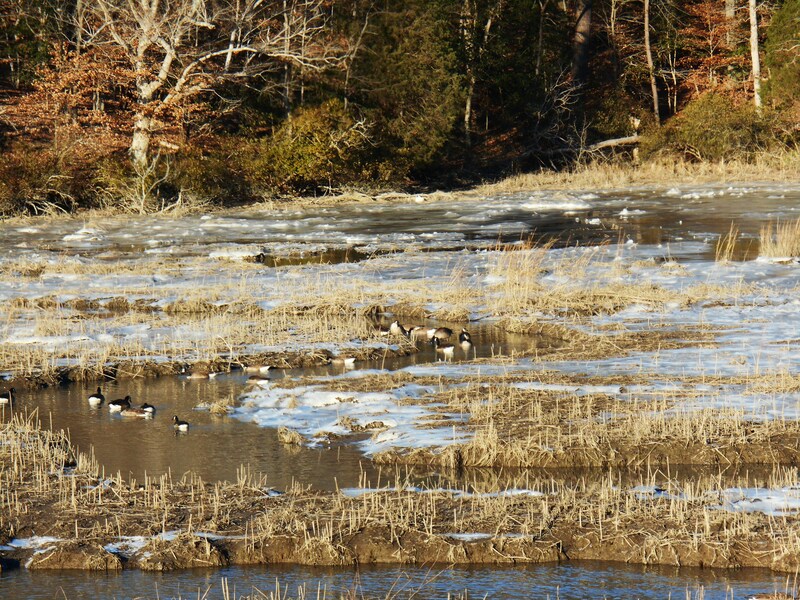 Ice covers the marsh at Halfway Creek where Canada Geese gather in search of food. The incoming and outgoing tides sound a constant, slow rhythm; shaping the contours of life along our many creeks, marshes, and rivers. 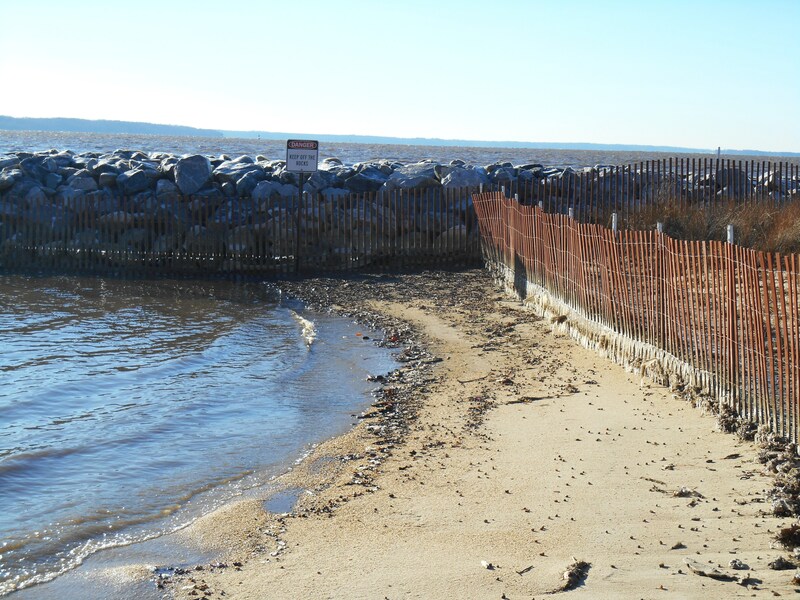 We are close enough to the coast that the James, York, Black, Mattaponi, Piankatank, Rappahannock, and Chickahominy rivers all respond to the tides flowing in and out of the Chesapeake Bay from the ocean. In our area, we all live surrounded by water; often brackish water, as salty water from the sea mixes with fresh water flowing off of the land. This was the slow realization of the first English colonists trying to survive in a hostile new land. Jamestown Island is surrounded by water, but it is all too salty and filled with life for drinking. There is no fresh water spring on Jamestown Island, as there are just a few miles inland where the settlers eventually moved. 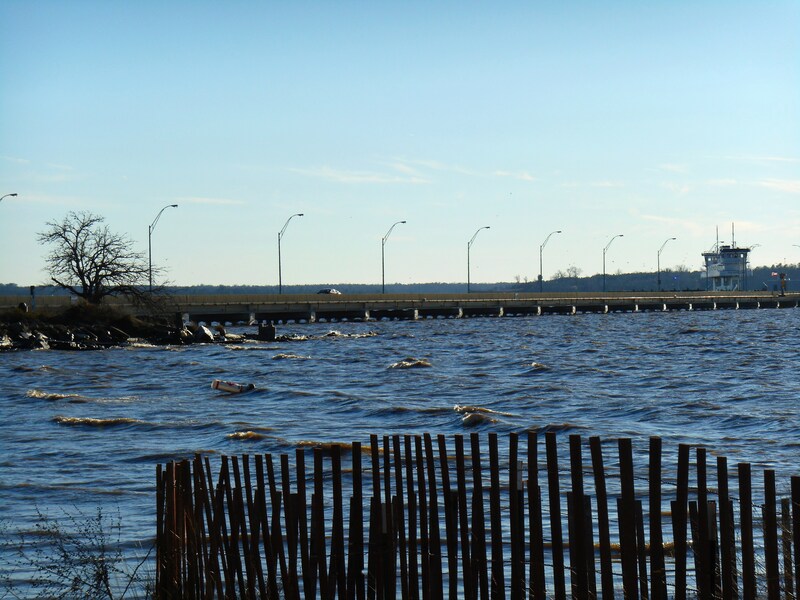 The James River at Jamestown Beach, near the ferry dock. Drought that first summer made the James even lower and saltier than usual. Living on the banks of a mighty river, whose origins lie far to the west in the Appalachian mountains; the settlers grew ill and died from the river’s water, the only water they could reach without confronting the native people defending their land. Jamestown Beach on Tuesday afternoon. At 21 degrees, with a wind, wild ice gathers at the high tide line. I’ve stood on the banks of the beautiful James, called The Powhatan in honor of the native chief before the colonists renamed it for their English king, just outside of the archeological dig and reconstruction of that original Jamestown settlement. There is a statue there of John Smith, looking out across the water, always seeing the possibilities for a rich and good life in this wild, new land. Smith was the one who learned to communicate and build relationships with the leadership of the Powhatan nation, a confederation of 30 tribes living here in Tsenacommacah, the densely populated lands east of the fall line at Richmond. 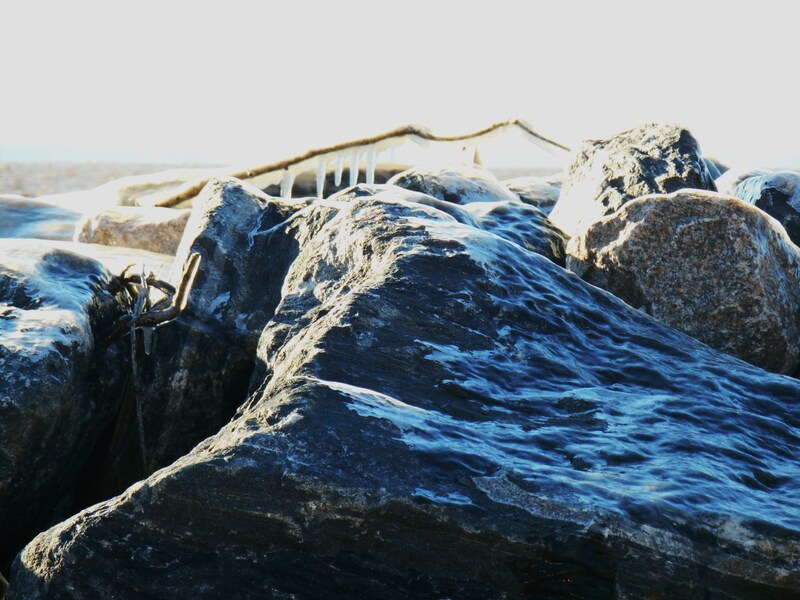 Salt spray frozen on the rock jetty at Jamestown Beach. Our coastal rivers in Virginia are named for these original people who drew their life and living from them. And, our rivers still respond to the rise and fall of the Chesapeake Bay. Our Bay is the meeting place of fresh rain water and water from natural springs carried by our rivers towards the sea, and tidal water surging in twice daily from the mighty Atlantic Ocean. Above: Green algae and other jetsam frozen at the high tide mark on the beach. 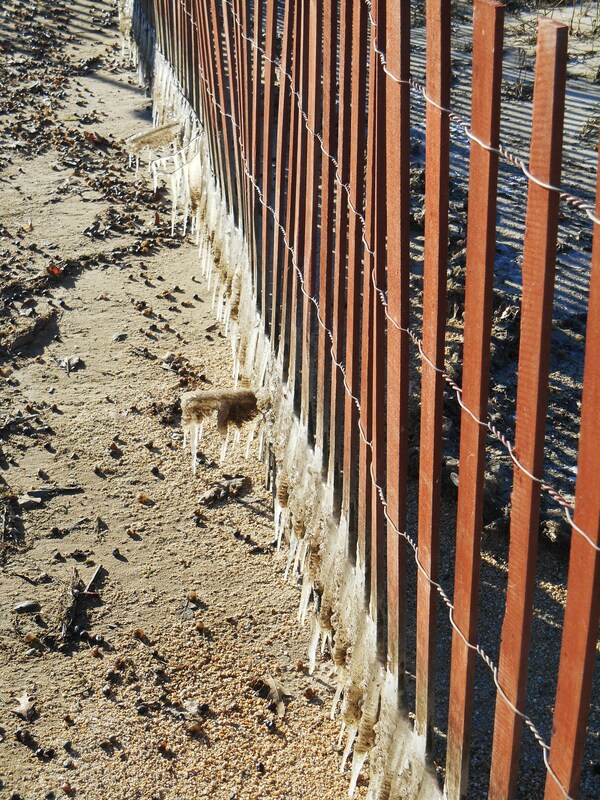 Below: Ice also collects at the base of the fence on the beach. 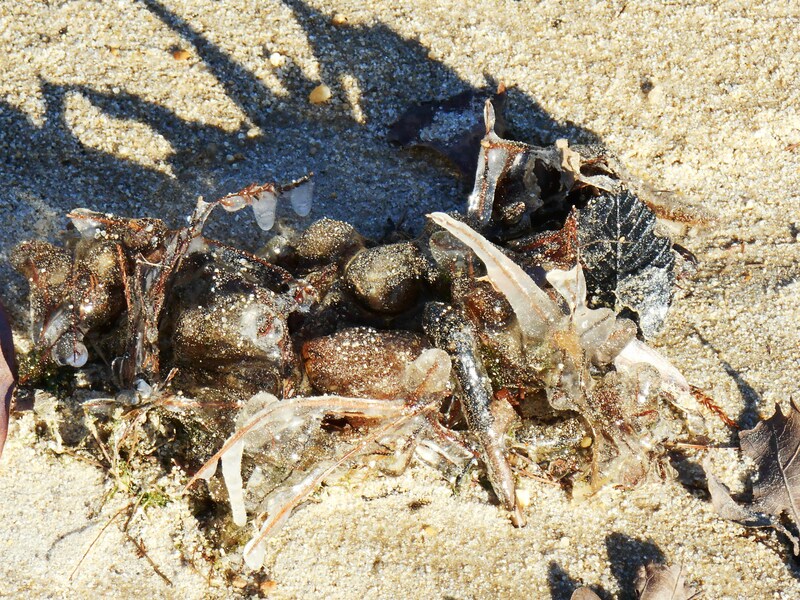 With the briny water comes all the life of the ocean: oysters, crabs, scallops, shrimp, black sea bass, flounder, menhaden, shad, and even the occasional dolphin. The colonists who stayed at the mouth of the river, where it meets the Bay, learned of these abundant sea foods and lived in plenty even as the colonists holding the fort at Jamestown starved. The saltiness of our rivers and creeks makes them slow to freeze. It is the rare extended stretch of freezing days and nights which allows ice to form any real distance from the shoreline. The constant rising and falling of the tides disrupts the ice even as it forms, breaking it again and again along the high tide mark as the water recedes. Wind swept spray may freeze on our rock jetties for a time until the sun melts it away. Rock and sand hold the suns’s heat, making it even harder for the salt spray to freeze along our beaches. Canada Geese feeding along the marshes on Halfway Creek. 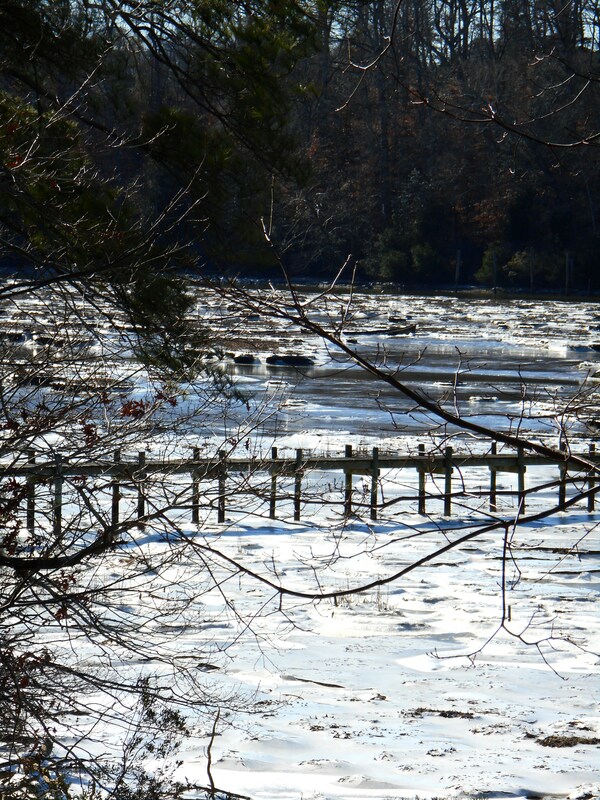 And it was this wild, briny ice we found along the James river yesterday, on a broad sandy beach near where the ferry docks. 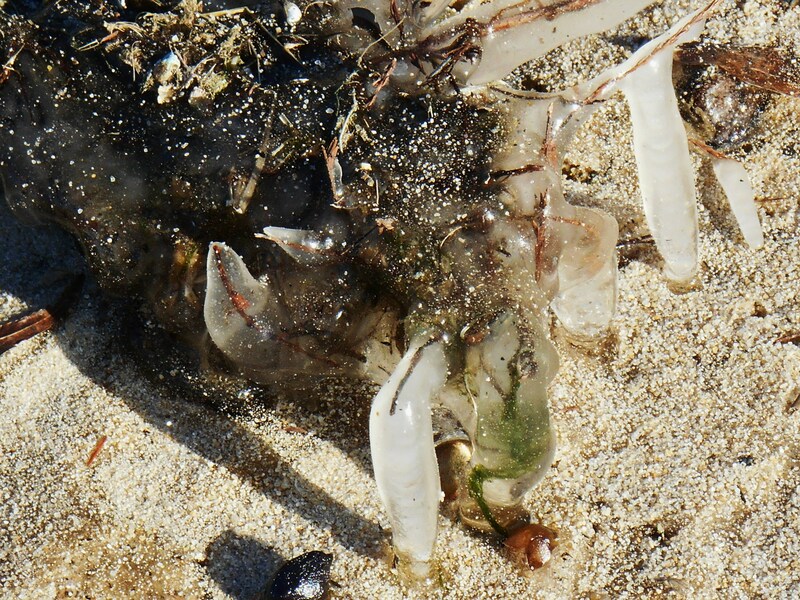 It encased bits of jetsam washed up at high tide, and clung to the fence protecting the jetty. It was 21 degrees, colder with the brisk wind, despite the bright afternoon sun. 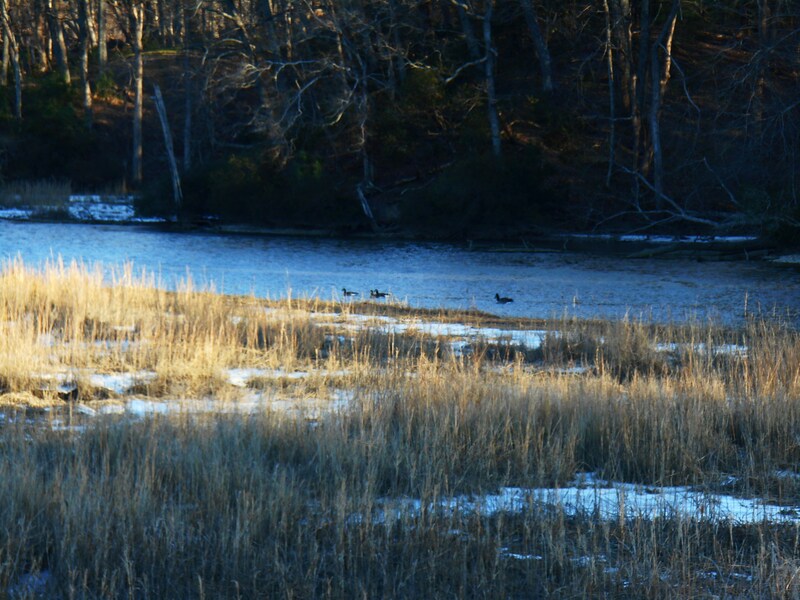 Geese swim in the open channel of Halfway Creek Tuesday afternoon, as the temperatures hover around 20 degrees. And in the more protected marshes, ice still clung to the thick mud, left behind by the retreating tide. 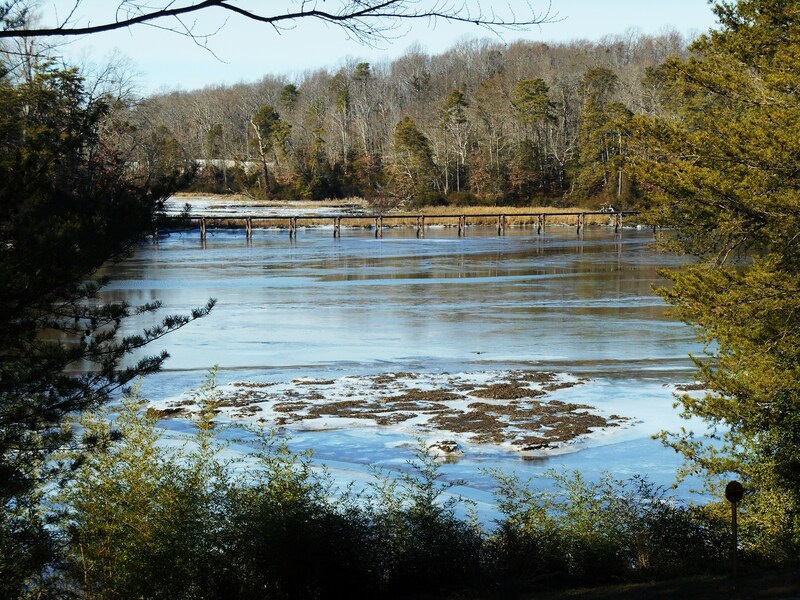 Kingsmill backs onto Halfway Creek and the Colonial Parkway. 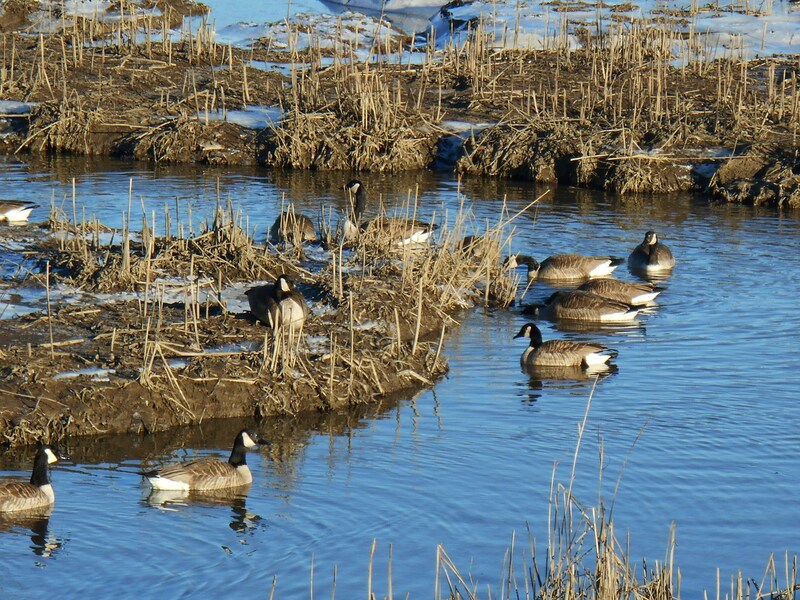 The deeper channels through the marsh were not yet frozen, allowing Canada Geese, ducks, and other sea birds open patches of water to congregate and search for food. The geese searched for bits of grass, seed, algae or other vegetative material left in the silt of the marsh. They will eat an insect or small fish if it happens by, but prefer to eat plants. Large flocks gather together in our area. Some have migrated south, and others live here year round; able to find a constant supply of food. With few predators, the numbers of shore birds continue to increase. College Creek at noon today, temperatures approaching 33 degrees. Our College Creek was frozen well away from its banks this morning, it shallow draft finally succumbing to several days of relentless cold. Only the deeper channels in the middle of the creek remained open and flowing at midday, allowing the tides to come and go. 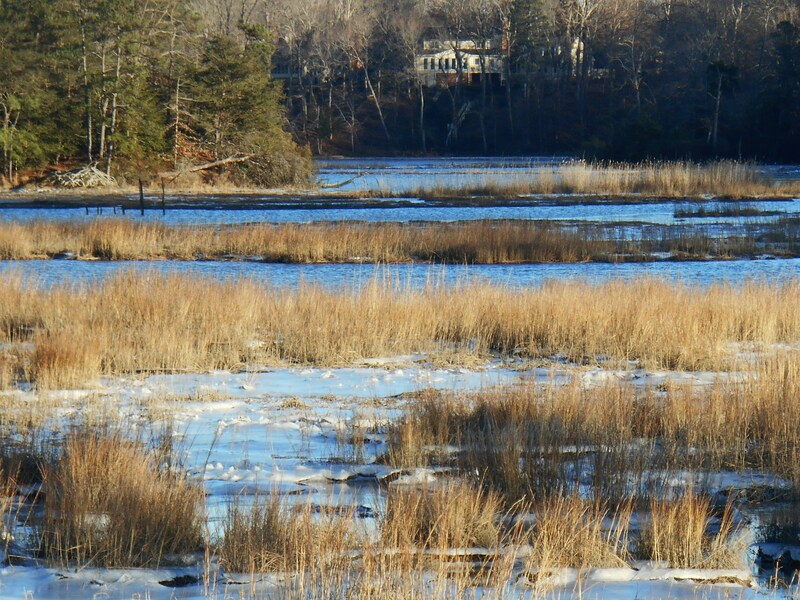 Our marshes were hardened with ice, high tide having come and gone in the deep cold last night. It gets harder and harder for the wild things who rely on the Creek for food to find any. They will move further inland; move to the cow pastures and horse pastures; the edges of woods; the neighborhoods even in search of the next meal, until the Creek melts back to its usual muddy softness once again. 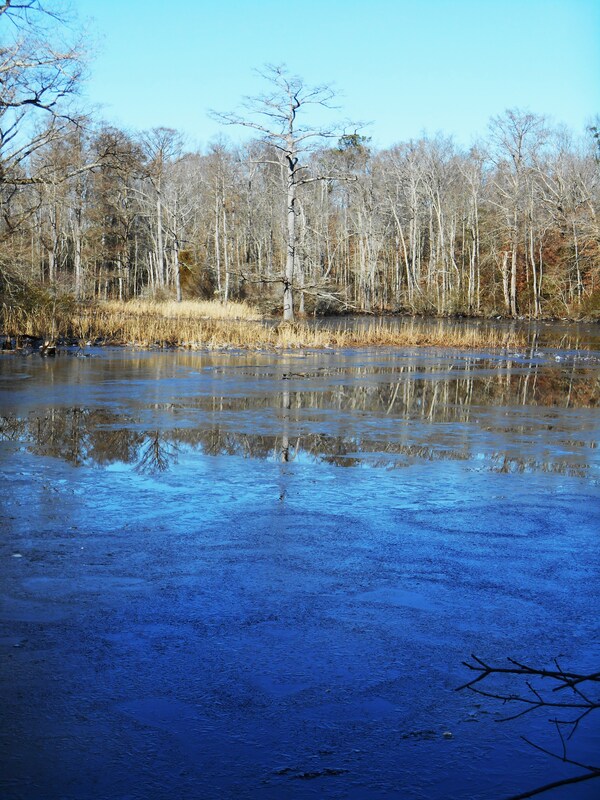 College Creek at noon today, flowing freely in the deeper channel, but frozen in the marshy shallows near the shore. Temperatures reached 39 degrees here today, I hope you guys are warmer today too!